It’s no secret that a major home remodel, especially in the kitchen, can increase the value of your home. We designed Harmoni to bring you the luxury quality of our Bentwood line at a lower price point, creating exceptional value. Harmoni does this through various internal efficiencies between our Dealers and the Harmoni Engineering Team. The materials and craftsmanship, however, remain the same! 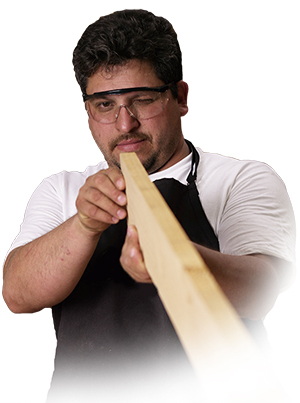 German hardware, premium lumber and plywood, gorgeous materials and impeccable stains, not to mention hundreds of years of compounded experience, come together to create a one-of-a-kind product that you’re sure to fall in love with. Want to know just how much value Harmoni cabinets will add to your home? Why not set up an appointment with one of our world-class dealers! When we first started our company, more than 27 years ago, we knew that a critical key to quality was crafting our own doors – no outside vendors or third parties. Due to the hand-sourced woods we use in all our projects, the result is uncompromised quality in color consistency. Our in-house door production also means that we can rapidly innovate. The outcome is a variety of more than 30 different styles to choose from. You can take your pick from clean and modern lines to more traditional forms. We’re sure to have a look you’ll love. Swing on over to the GALLERY to see all our door styles. Prefer to see them in person? You can visit one of our exclusive showrooms too! In our factory, it’s not uncommon to see one of our Finishers leading the selection of lumber and plywood for a project to ensure the final set of cabinets looks consistent. Throughout the production process, we sand and sand…and then sand some more, making sure every part is just right before applying our proprietary finish. Attention to an exquisite finish means you get a final product like no other. Not only that, the expert application of our finish adds life to your cabinets as well. This means you’ll be able to enjoy their beauty for years to come. You can easily see many of the great looks our designers have come up with by heading over to our EXPLORE PORTAL or GALLERY. We’re sure you’ll find one you love! Since our cabinets are part of your home, it only makes sense that we treat them like our own. We make everything in-house, and go to incredible lengths to coordinate the color and style your project. Truly, you’ve never seen attention to detail like this. Edge-to-edge, our cabinets are finished with the same quality as the exterior finish. Even the interior accessories are coordinated with the box construction of the drawers. This means exceptional beauty – inside and out. Be assured, our attentiveness doesn’t end with cabinets. We want to hear from you to make your project perfect. Get in touch and tell us what you like HERE! We are connoisseurs of craftsmanship. Simply put, we love beautiful cabinetry! Our stylists have one thing in common – a passion for the finer things. In fact, this passion is the undercurrent of every new look or style we offer. Every year, we study what’s new and fashionable in the kitchen industry. This dedication to best-in-class style is evidenced by the company we keep with premier suppliers, talented designers and experienced craftsmen. Want to see for yourself? We’d love to show you. Head over to the EXPLORE PORTAL. Every year, Harmoni adds beauty to hundreds of the most exclusive homes in the nation. Even though we operate on this impressive scale, we affectionately use client names when referring to each new respective project. You could say this personal touch is one of the secrets to our success. From initial design to final assembly, and everything in between, we begin every new project from scratch. This begins by hand-selecting materials which we choose just for you. From there, our craftsmen team together on your one-of-a-kind project to produce a result that is second to none. Ready to start the conversation? We would love to talk to you! CLICK HERE to find a dealer and start your personal cabinetry consultation. A healthy home is a happy home. We live here too, and understand the importance of protecting and caring for the environment that surrounds us. We carefully construct eco-friendly cabinets that bring your kitchen to life with a soft touch on the environment. Harmoni is proud to use enviromentally managed lumber and CARB II Compliant plywood to make guilt-free cabinets that perfectly fit the style of your life and home. You can rest easy, knowing that you are making the right decision of choosing a product that utilizes the latest in environmentally friendly technology. Want to know more about our environmentally friendly cabinets? Find a showroom near you to learn about our unique materials. CLICK HERE to see how.